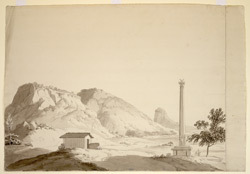 Between March 1792 and April 1793 the Daniells travelled through South India which at that time was still very little explored by the British. After the flat landscape interspersed with paddy fields and coconut palms and the rocky hills surrounding Arcot, the artits moved through the dramatic hilly country south of Bangalore, visiting the various hill forts where Tipu Sultan's soldiers had held out against the British. In the distance, in this drawing, is the astonishing rock rising out of the plain referred to in William Daniell's journal. In the foreground is an apparent temple inside a hut with a worshipper is kneeling before it and a carved monolithic 'dhvajastambha' or pillar before it.